The newspaper trend has been on my to-do list for the longest time so I figured that it was about time that I finally did it. I spruced it up with a French tip thanks to the tutorial via Orly. I took a bit of an old-fashioned sepia look and did a biege base colour instead of the usual white. I used American Apparel California Trooper as a base with bits of the local paper on top. 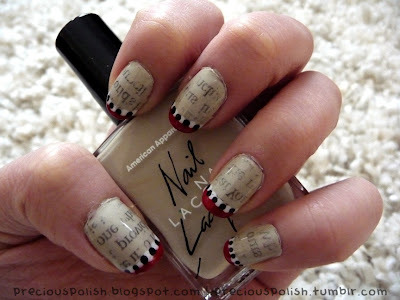 I used striping polishes and a dotting tool for the French tip.